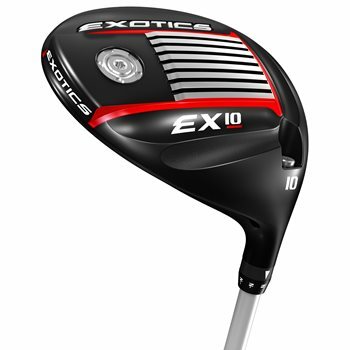 The Tour Edge Exotics EX10 adjustable driver is available in 10 and 12 degree adjustable heads and features a new hosel system that doubles the adjustability options, allowing players to raise or lower the loft as +/- 2 degrees. The 460cc head features new 8-1-1 Titanium chassis with a new TSP 910 Beta Ti face plate to increase the sweet spot. The new head profile and additional speed channels reduce aerodynamic drag for faster club speeds and maximum distance off the tee. The increased heel weight and the aerodynamic design help to provide faster speed, higher MOI, less spin and more distance.The driver includes a 10-gram adjustable sole screw housed in a 9-gram weight pad for deep sole weighting.